As an E cigarette explosion attorney in California, I am seeing a rising number of incidents where E-Cigarettes are malfunctioning, catching fire or even exploding and causing serious bodily injury. What started as an “alternative” to regular cigarettes, has now become a multi-billion dollar enterprise where these products are selling millions of units all over the world including California. I am seeing more storefronts, especially in urban areas like Los Angeles, selling “electronic cigs” , “vapes” , “vapor pens”, “Vaping” and “Vapor” devices. Unfortunately, these products have flooded into the marketplace in CA and across the U.S. without much early regulation or quality control. This had led to issues where the products are heating up to a dangerous level, exploding and causing many types of injuries. What is Causing E-Cigs to Blow Up? E-Cigarettes are meant to mimic the sensation of traditional smoking by releasing a vapor to the user. The process by which this takes place is a heating element inside the device that brings the liquid vapor solution to a boiling point. This heating element must have a power source and that source in almost all types of vaping products is a lithium ion battery. The problem arises when this heating process causes the electrolytes in the battery to overheat, expand and rupture. The danger of such an explosion is further amplified by the fact that the batteries are located at the end of a cylindrical tube that is often made of either plastic or fairly low-strength metals like aluminum. The combustion can cause all or part of the E-Cigarette to be propelled outward and into the face, neck, hands or arms of the user. A 26 year old in Tustin, CA had to be rushed into emergency surgery when an e-cig exploded in his mouth. A small piece of the apparatus was lodged in his mouth and had to be surgically removed. He also sustained second degree burns to his face and lost several teeth. A man in Bakersfield, CA had to have his left (dominant hand) index finger amputated when a device exploded as he was putting it to his mouth to smoke. A jury in Riverside County awarded a lady $1.9 Million dollars against the distributor of e-cigarettes due to injuries sustained after the combustion of the device in use. A retired Los Angeles Galaxy soccer player filed suit after suffered facial damage that made him “unrecognizable”. This case is still pending in the Orange County Superior Court. California, like most states, has laws that are meant to protect consumers and allow for compensation if they are injured by any type of product that is either negligently manufactured or negligent in its design. Causes of action for recovery of damages may include so called “strict products liability”, failing to warn users of the potential dangers of product use and breaches of express or implied warranties. The problem becomes that many of these products are being sold by “mom and pop” retailers that may not have insurance coverage. Holding both the manufacturers and distributors are possible under California products liability laws, however, many of these devices are being manufactured in China and other places and tracing the origin of the product can be difficult. It may also be difficult enforcing a money judgment against a foreign company. This leaves personal injury attorneys having to do a little further investigation into other possible defendants such as U.S. companies that import the products into the states. Once litigation has commenced, other hurdles still remain. 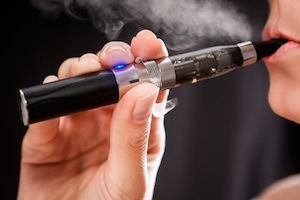 One of the main counter arguments is that the victim was “ comparatively at fault ” for their own injury by their use or alleged “misuse” of the e-cigarette vaping devices. These arguments can be overcome by a quality personal injury law firm familiar with product defect claims. For example, there are many consumer products such as cell phones that are prone to heating up with use but, have not been found to explode. Therefore, the average consumer would not consider this to be a likely scenario. The bottom line is that e-cigarettes are being sold by the millions to consumers all over California from Los Angeles to the San Francisco bay area. When used as a normal consumer would (i.e. in a manner same or similar to a regular cigarette), the devices should not heat up to the point where they explode and send shrapnel into the hands, face and body of the user. If this happens and serious bodily injury like blindness, amputations, facial disfigurement or other similar bodily harm occurs, you should consult with a California products liability law firm familiar with these types of cases. Retaining the defective device and seeking legal advice as soon as possible can make all the difference in being able to seek justice through a civil lawsuit for personal injuries.